Have you ever thought about making your own bagels? It's not that difficult, and these made-from-scratch bagels will come out better than any store-bought version. 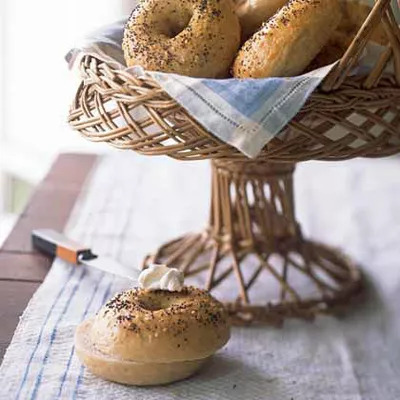 This recipe uses one bottle of brown ale, such as Newcastle Brown Ale, to give the bagels a delicious and unique taste. One half of the beer is used to dissolve the yeast, bread flour, and egg white to make the dough, while the other half is used in a step that creates a crunchy exterior. Once the dough is prepped, you boil the remaining beer, 4 cups of water, and sugar, and gently lower each bagel in the simmering beer mixture for 1 minute. After brushing the bagels with a yolk mixture, sprinkle with sesame and poppy seeds, and bake for 17 minutes. Yum! Each bagel is only 200 calories and low in cholesterol and saturated fat. Next thing you know, you may be thinking it's time to open your own bagel store!